It may have taken him 10 starts to break his maiden but Chas Marlow has taken a liking to the winner’s circle, making it consecutive wins this afternoon when leading all the way at Wodonga for Mornington-based trainer Tony Noonan. 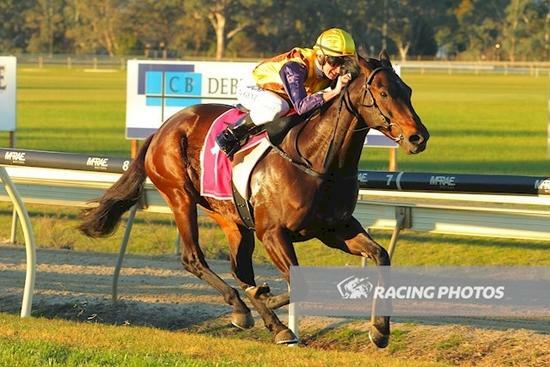 Having raced far and wide across Victoria from Stony Creek to Mildura in just a dozen starts, the 4-year-old gelded son of Widden Valley has taken a liking to the travel with his maiden win coming a fortnight ago at Wangaratta. Although Noonan was over in Adelaide where he had a a runner, he was delighted for owner-breeder Graeme Ward who has been a stable client for more than 25 years. Jumping well from barrier 9 in the full field of 14 under apprentice Teodore Nugent, Chas Marlow’s excellent tactical speed enabled the young rider to effortlessly cross the field and find a comfortable lead. Relishing the Soft 6 conditions, Chas Marlow ($2.45F) was cruising by the 400m mark as others back in the field were off the bridle trying to chase before Chas Marlow gave a strong kick to run clear and hold Kapover ($12) by 3 lengths in second and Doogan’s Destiny ($12) a further length back in third. The win capped of a career defining day for Nugent with Chas Marlow delivering his third winner for the day and first career trebble.